I’ve downloaded VS2010 SP1 Beta, EntityFramework CTP 5 and SQLCE tooling for VS2010 Beta. Today I want to create the SIMPLEST demo to show it hangs together. It will not take long!! 1. Create a new console app. 2. Add the references to the new EntityFramework assembly and the System.ComponentModel.DataAnnotations assembly. 3. Create two very simple classes, Master and Student. Note the use of the [Key] attribute to define the primary key. The default convention will be that a identity column will be created for these columns. 4. 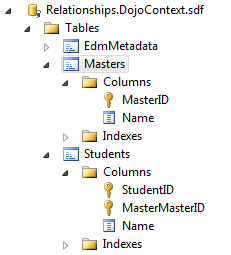 Define the database context that will hold the collections of Masters and Students that define the domain. Note how I’ve specified the use of SQL CE 4, but I haven’t had to include a reference to it anywhere. Run this program. On the first time nothing interesting happens. But then run it again, and you’ll see that the Master and the Students have been retrived from the database – persistence in around 10 minutes!! You can the use the familar “Show Table Data” context menu option to edit the table data. 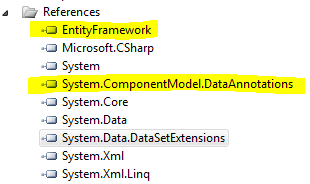 In this short brefing I have covered the barest minimum to create a datastore using the features of the new Entity Framework “Code First”. Like I said, this was the most basic, 100-level example of code first but it should give you an idea of what can be done. In future posts I will covering database initialization and configuration strategies. This entry was posted in Design Patterns, Entity Framework, SQL CE. Bookmark the permalink.